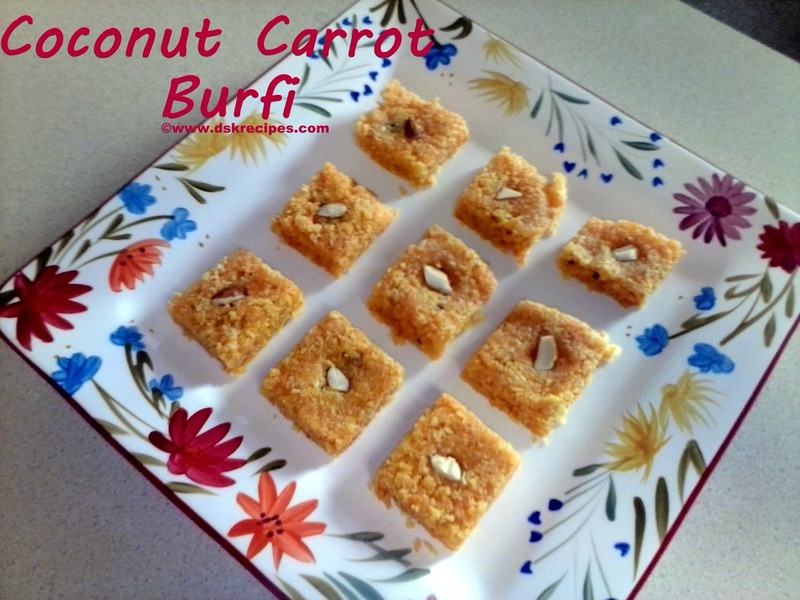 Coconut Carrot Burfi is very simple and and easy to make microwave recipe. It's healthy too, specially in winters. 1. Mix well ingredients in a bowl except almonds and ghee, and then grind it into fine paste . 2. Take this mixture in a Microwave safe bowl and Microwave on high power for 2 minutes. 3. Stir and again microwave for 3 minutes. As the mixture starts becoming dry,repeat the method till mixture becomes smooth and thick. 4. Take plate or any plane surface tray and coat it with ghee. Keep it ready. 5. Pour the mixture and with the help of spoon spread it evenly. 6. Garnish with crushed almond. 7. Cut it in square shape or diamond shape pieces and once it cooled remove and store in air tight box or you can refrigerate it. 8. Enjoy your dessert up to 2 weeks. Thank you Gauri Pimprikar for sharing the recipe.